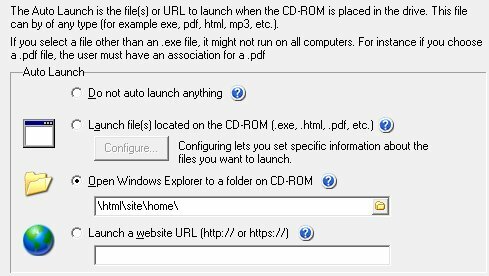 AutoRunWizard.com - AutoRun Wizard FAQ - How can I open Windows Explorer to the CD-ROM drive? In the latest version of AutoRun Wizard you can open a folder at the root or you can choose to open a folder. There are 2 ways to accomplish opening the Windows Explorer to the CD-ROM drive. The first way is if you are not going to autorun any other files. 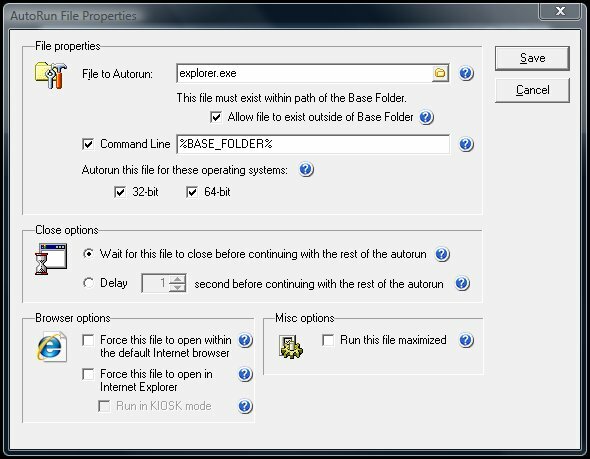 If Windows Explorer is the only option for your autorun then you can simply choose the option on the Auto Launch tab to 'Open Windows Explorer to a folder on the CD-ROM'. You need to choose 'explorer.exe' as the file to autorun. Then you must choose the option to 'allow the file to exist outside of the Base Folder'. Add a command line option to the %BASE_FOLDER% macro (case sensitive). %BASE_FOLDER% = The full path to your base folder on the target computer. For example if the CD-ROM drive on the computer was the F:\ drive, %BASE_FOLDER% would resolve to F:\. Then save that autorun file and test your autorun. When it gets to the explorer.exe autorun, it will open Windows Explorer to the CD-ROM drive.